Eat using a Spün utensil! As you eat, you can look at the Spün app to see real-time stats on your current meal and for the day, including how many calories you’ve had, how fast you are eating, and more. Over time, Spün will give you food recommendations so that you can meet your health and fitness goals! Spün utensils use patented technology to accurately calculate calorie and nutritional information for each bite of food you eat. Spün utensils and the Spün mobile app are designed to provide you with as much (or as little) data on your eating habits as you'd like. 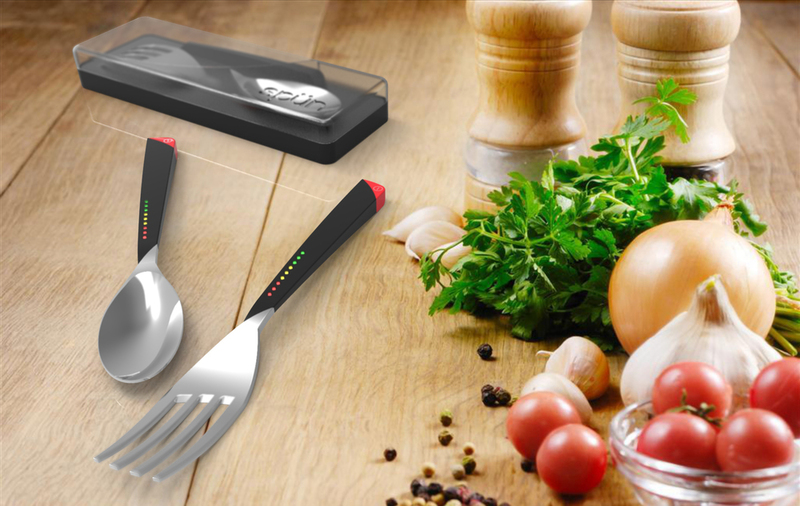 Spün utensils measure the exact weight of the food going into your mouth and convert the weight to calorie and nutrition information in real-time! Set calorie or nutrition targets for a meal and Spün will give you a gentle buzz when you’ve hit your target. Eating too fast? Spün will let you know. Spün uses photo recognition to automatically detect what food items are on your plate.